Today we are heading up into the Atherton Tablelands and visiting waterfalls and Paronella Park on another day trip. Brett, our driver for the day picks us up at 7.20am. 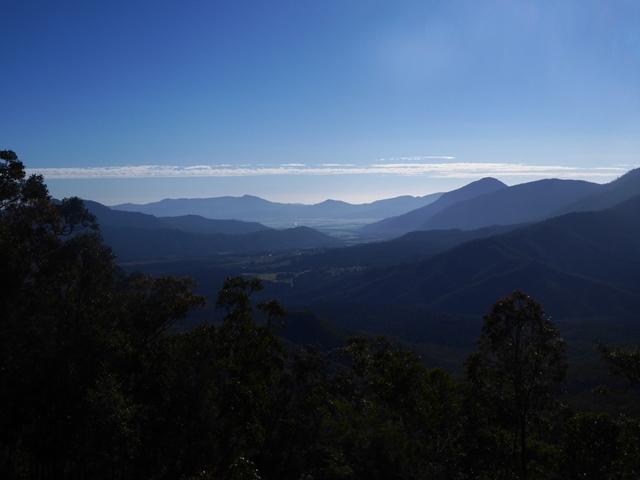 We head south out of Cairns this time and ascend up into the Atherton Tablelands via the Gillies Range Road with magnificent views over the Mulgrave Valley. Our first stop for the day is at Lake Barrine, a beautiful rain-filled volcanic crater set amongst World Heritage Rainforest and home to a wide range of wildlife. We first visit the tea rooms for tea with scones and jam, and are surprised at how much colder it is here. Then we head out for a cruise on the lake, where our host points out various plants and animals of interest – including a snake sunbathing in the grass. We also stop to feed turtles, eels and tilapia fish that come rushing in to greet us and have very few manners when it comes to getting the most food. Then we drive across the Atherton tablelands being surprised by how lush and fertile it is compared with the region we passed through on the way to the Chillagoe Caves earlier in the week – that is not very far away but was very definitely dry savannah grasslands. This area has dairy pastures and a vast range of crops including banana, sugarcane, corn, avocados, strawberries, macadamia nuts, mangoes and citrus. It is sugar cane harvest time and we again see sugar cane trains being loaded and taken to sugar refineries. We also stop to view a magnificent Curtain Fig tree. We have a short stop at the Millaa Millaa Waterfalls and then travel down the Palmerstone Highway to Innisfail for a buffet lunch at an Italian Restaurant before heading to Paronella Park where we spend a few hours. Paronella Park is a strange combination of Spanish Castles and pleasure gardens set in the rainforest. Jose Paronella came to Australia from Spain in the early 1900s to work in the sugar cane industry. When he married he wanted to build his dream of a park that would be open to the public: it had a house, tea gardens, refreshment rooms, a theatre, hall, a grand staircase leading to the bottom of a waterfall and much more. In the 1970s the family sold the park and then fire, floods and cyclones swept through it before the current owners opened it up again in the 1990s. It is strange to see formal structures and plantings but it is a very beautiful place to wander in the shade of the cooling trees beside the stream. There is even a turtle nesting area and we are given food to feed them with. On our way back to Cairns we stop at a roadside stall to see local fruits and vegetables. Gill and I decide that we will purchase some fruit to have for our dinner (as we won’t need much after our large lunch). When we get back to our hotel we discover that there is a bottle store just 5 minutes walk away so we purchase a bottle of wine and some nuts to go with our fruit and settle in for a relaxing evening. It is a relatively short evening as we are still sticking with NZ time and going to bed 2 hours early so that it makes getting up early in the morning easier.